Why Do We Need HEVC Players? And How to Get? As the successor to h.264, h.265 (HEVC) strives to deliver video with equivalent quality with bitrate savings of up to 50 percent and has gradually become mainstream. Whether it is the demand for HEVC movies download or HEVC converter is constantly growing. So, everyone has more and more HEVC videos. This is no wonder why everyone is looking for the best h.265 player to play their own HEVC videos. Here, we pick out the 4 best free x265/HEVC players that support h.265/HEVC without the need of any third-party HEVC codec and plug-in. Free HD Video Converter Factory is the industry acclaimed HEVC player. No matter what kind of HEVC video can be easily played. 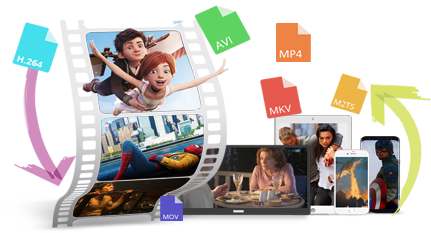 In addition, if you want to convert HEVC video to other formats such as MP4, AVI, MKV, etc. are also allowed. Try it without any loss! H.265/HEVC is an advanced and efficient video codec, especially suitable for streaming 4K/8K video. Higher efficiency is often accompanied by complexity, which is why h.265 codec is difficult to perform. Hence, it is worth noting that not all mainstream devices support the h.265 format, which makes it impossible to play HEVC videos on incompatible devices unless you have a professional h.265 player. But you don’t have to worry too much about this issue, here we already picked out the top 4 free X265/HEVC players for you to make right choice. WonderFox H265 player - Free HD Video Converter Factory enjoys an excellent reputation among users. The creative and diligent team focuses on the needs of users and has been creating a simple and practical X265 HEVC player. This HEVC player can support playing HEVC 8-bit, 10-bit and even 12-bit video without any extra H265 codec or plug-in downloads. Besides, the unique core of WonderFox HEVC player makes it recognize and read the H.265 video fast, and process and display it on the user computer as quickly as possible. More importantly, it allows you to convert HEVC video to any other formats and reversal is also feasible. I believe most people will not be unfamiliar with VLC. 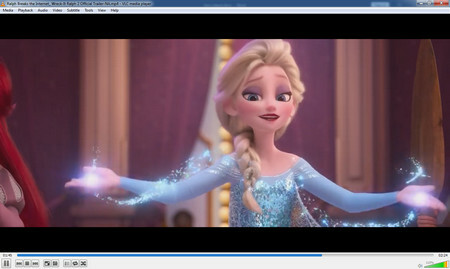 Previously, we recommended VLC media player in the recommendation of AVI player, MOV player, and MKV player. 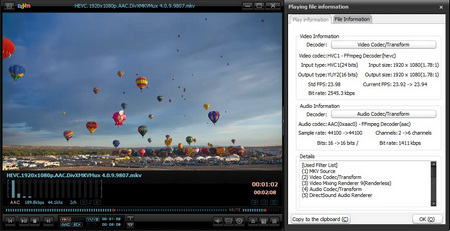 Actually, it is a powerful media player that supports all kinds of video formats including HEVC, but the old version of VLC for playing an HEVC format video, it requires to download a specific x265 as a free software library and application for encoding video streams into the H.265/MPEG-H HEVC compression format. Hence, you’d better to update your VLC media player to the latest version. The 5KPlayer software handles media files well just as many other media players are capable of doing. It supports videos in MP4, AVI, WMV, FLV, MKV, MTS/M2TS, H.265/264, VP8/9, WebM. 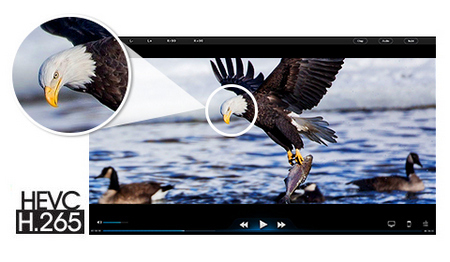 Meanwhile, the intrinsic support to stream H.265/HEVC coded videos from Mac and PC to Apple TV is also enhanced. DearMob has sharpened the H.265/HEVC playback feature of 5KPlayer, and meanwhile added a new feature that enables the application to play a certain portion of damaged H.265 files. 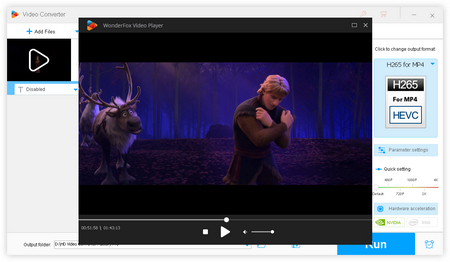 Poyplayer is indeed one of the best multi-media players for Windows out there today. This free X265 player supports an expansive library of video codecs so that you don’t need to download or install any HEVC codec pack. Besides, it allows the user to correct certain problems one may come across in some videos like audio is not synchronous with the video. These are the 4 most suitable HEVC players we have compiled, you can choose anyone you like to download. While if they still can't play your HEVC video, then converting HEVC/H265 to H264 is also a great idea. Hope this article can help you and you are free to share it with more people! Best professional video converter enables you to flawlessly convert H265/HEVC to H264 with original quality at fastest speed thanks to advanced technology. Easily convert one video to different video formats including MKV, M2TS, MP4, AVI, MPEG, WMV, MOV, VOB, FLV, WebM, etc.